All meals onboard Indian Pacific, FREE beverages throughout your journey, FREE toiletries kit, Cabin Steward Service, in-cabin music and commentary, use of "Outback Explorer Lounge"
Enjoy a leisurely day at your own pace before being transferred to Murray Bridge this evening to board the Proud Mary. After settling into your comfortable river view cabin enjoy a delicious supper and meet the crew, introduced by the Captain. Cruise under floodlight to your overnight mooring of Sunnyside and take in the river environment from a completely different perspective. Look for nocturnal wildlife and birds of the area such as night herons and owls as you glide past the graceful willows and dark waters of the Murray River. Breakfast, Transfer to Murray Bridge, Dinner, Overnight Accommodation Onboard the Proud Mary. Depart Sunnyside and cruise upriver taking in some of the best scenery of the Murray River system. The willows along the river bank were planted in the early 1900’s by riverboat captains to clearly mark the main river since the inland lagoons were so large that they often could not find clear channels to navigate. Enjoy a hearty buffet breakfast as you cruise towards Mannum. Take a short stroll through this historic town and visit Mannum Dock Museum for an insight into the early days of paddle-steamers and this aboriginal settlement. Depart Mannum and cruise upstream through Younghusband and Teal Flat while you enjoy a sumptuous lunch prepared by your onboard chefs. Immerse yourself in the beauty of your surroundings as you enjoy a guided cruise though the lagoons and inlets of the Murray River on a small boat with an expert ecologist. Enjoy a drink with your fellow travellers this evening before enjoying a traditional Aussie barbeque on the riverbank under a canopy of stars. Later, enjoy live entertainment around a campfire. You can even request a song and sing along with your resident musician! Breakfast, Self-Guided Tour of Mannum, Lunch, Guided Ecology Cruise, Special Barbeque Dinner, Overnight Accommodation Onboard the Proud Mary. Spend some time this morning exploring the bush further if you wish. Cruise back downstream to Mannum while you enjoy a hearty English breakfast. Depart Mannum and enjoy a smorgasbord lunch while you cruise downriver to Murray Bridge via Ponde, Caloote Woodlane, Mypolonga and Willow Banks. Enjoy a video presentation of the Murray River ecology as your 3 day cruise comes to an end. Get picked up from Murray Bridge and transferred back to Adelaide for the night. Breakfast, Reedy Creek Environmental Park Guided Tour, Lunch, Overnight Adelaide Accommodation. Time to say goodbye to beautiful Adelaide your fellow travellers and friendly hotel hosts. You will be personally met at your hotel by a DISCOVER AUSTRALIA representative and transferred from your hotel to the airport for your flight home. Relax in your river-view cabin with private balcony onboard the Proud Mary along the Murray River and enjoy FREE full board cuisine, FREE onshore tours, FREE guided nature walks and eco-excursions, FREE onboard presentations, FREE live entertainment, FREE bike and canoe hire and FREE onboard tea and coffee. Cook (Perth to Adelaide): Enjoy a self-guided walk of this deserted outback town. 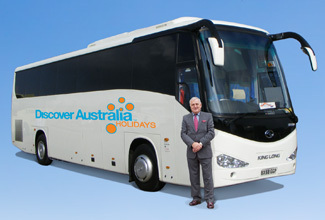 Broken Hill (Sydney to Adelaide): Choose from a selection of included tour options. 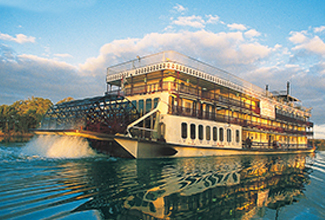 Join us aboard this superbly appointed premium riverboat for a gourmet cruise experience on the mighty Murray River. The stylish bar, lounge and dining areas provide the prefect location for indulging in the culinary delights of our resident chefs, while experiencing the passing amazing scenery. The recently refurbished MV Proud Mary is a purpose-built boutique cruising vessel providing an intimate and friendly atmosphere and offering a true insight into South Australia’s bushland and famous Murray River. Departing from Murray Bridge, just one hour out of Adelaide, the Proud Mary caters for a maximum of just 40 passengers and provides the ideal environment for passengers to explore, experience, indulge and discover all the river has to offer. The vessel, designed by Naval Architect Mr Peter James, was built in 1982 on the banks of the Murray River in Berri, South Australia, by the Berri Ship building company. It was purposely built with a shallow draft, allowing the vessel to safely navigate shallow sections of the river. The style of the vessel evokes the majestic Mississippi river cruisers. The Indian Pacific to Adelaide All-Inclusive with Proud Mary 3 Day Murray River Cruise is very popular. Many dates book out well in advance, please book soon.